Mad Poets Society has been an integral part of the Philadelphia writing community for many years. 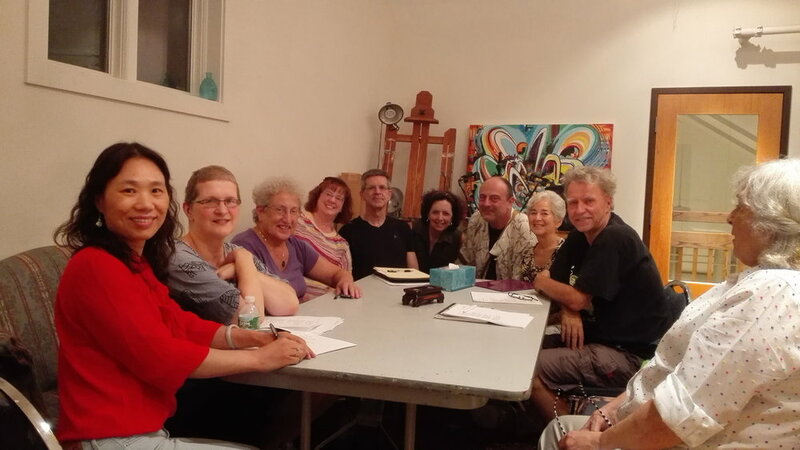 With more than 100 members in six states, and some members worldwide, we are an active organization of poets and writers who have joined together for camaraderie and critique with heart, to celebrate the creative soul and to promote the literary arts. The Mad Poets has coordinated well over 1500 readings since 1986; offering dozens of events each year, including master classes, informative workshops, informal critique circles, open mic nights, and poetry readings featuring talented and distinguished local, regional and national poets, musicians and writers. Bonfire: Anna Evans, Don Hucks, Dan Maguire, Rachel Bunting, and friends! ... More poetry & music under the stars! Linda Fischer at the Institute of Science, Media. Dan Maguire and Eileen D'Angelo, both presenters, at the National Federation of State Poetry Societies Conference in Harrisburg. David Gray, featured presenter, at the Institute of Science. Ed Krizek inspired by Kadinski's "Little Painting with Yellow"
Ray Greenblatt shares a poem inspired by "Carnival Evening." Harry Reichner reads a poem inspired by "Lotus"
Nick Lutwyche shares a poem inspired by Monet's "The Japanese Footbridge and Water Lily Pool"
Poets & Audience on the Inside Out Walking Tour of Media, at Moran's "The Grand Canyon", Delco Courthouse.